I often find out when I write a final exam that I write way too many questions, because I want to test everything! Unfortunately, I can't inflict this on my students -- the final exam needs to be of a reasonable length. 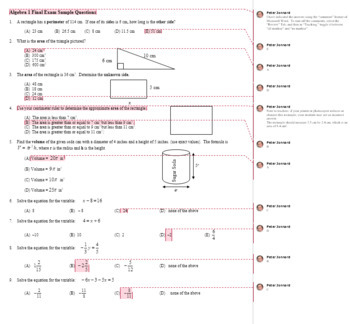 This two-page practice final exam represents the leftover questions from a multiple-choice final exam. They are pretty uniform in quality and random in content coverage, because I literally used a random number generator to remove a certain percentage of the problems on my final, and these are the numbers my spreadsheet came up with! I have used them to help students practice for the actual final exam -- to get them used to the format of the final. It also serves as an excellent sampling to get an idea of how well they are prepared. Note: I have used the "comment" feature of Microsoft Word to indicate the correct answers. To toggle between seeing comments and not seeing them, select the "Review" tab, and then under "tracking," change it to "all markup" or "no markup."